Darrell Ricksger passed away in his rural Hubbard home after a ­valiant battle with cancer. Darrell was born in Oregon City to Lynn "Bob" & Edna Ricksger on May 28, 1949. In 1967 he graduated from ­Molalla High School where he was an active FFA member. Darrell graduated from Oregon State University in 1971 with a degree in Agriculture Education. 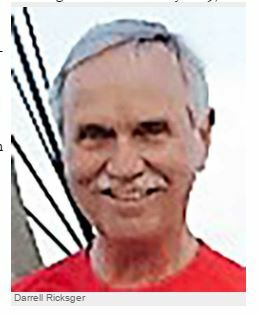 He was a Vocational ­Agriculture Teacher and FFA advisor for 30 years, teaching in the Cottage Grove, North Clackamas, Molalla and Canby School Districts. He retired from the Canby School ­District in 2004 after 20 years. Darrell's love of teaching and agriculture made a perfect combination as he taught and mentored numerous young people over the years. Darrell married Sandra Roberts on June 23, 1973 and together they raised two amazing sons, Trent and Todd. Darrell served on the 91 School Board prior to unification with the Canby School District and assisted with the transition. He also served on the Clackamas County Fair Board and numerous other committees and ­organizations. Darrell is survived by his wife Sandra, son Trent (Lindsey), son Todd (Toni) and grandchildren (whom he adored) Presley, Cason, Walker and Callan. A Celebration of Darrell will be held on July 23, 2016, 1 pm, in the 4-H Pavillion at the Clackamas County Fairgrounds.